The abbreviation of stacking screw machine is a kind of water treatment system for municipal wastewater treatment engineering and petrochemical, light industry, chemical fiber, paper, pharmaceutical, leather and other industrial industries. 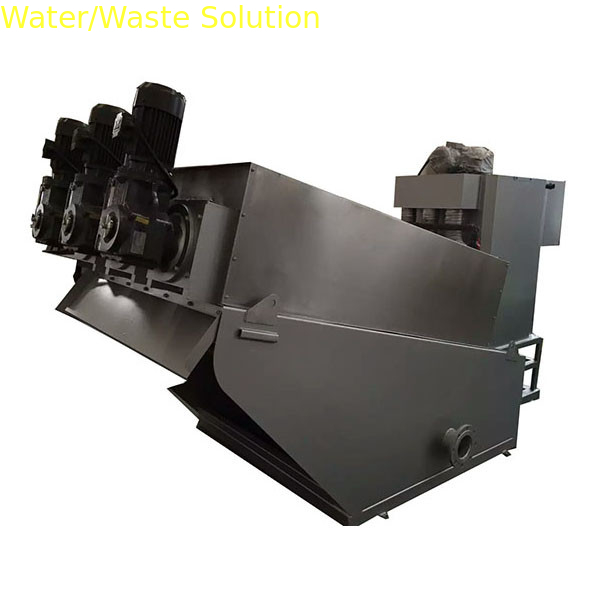 The actual operation proves that the stacked screw sludge dewatering can create considerable economic and social benefits for customers. 1. The main body of the dewatering machine is a filter device formed by a fixed ring and a swimming ring stacked on each other, and a screw shaft is formed therein. The front part is a concentrated part, and the rear part is a dewatering part. 2. The filter joint formed between the fixed ring and the swimming ring and the pitch of the screw shaft gradually become smaller from the enrichment portion to the dehydration portion. 3. 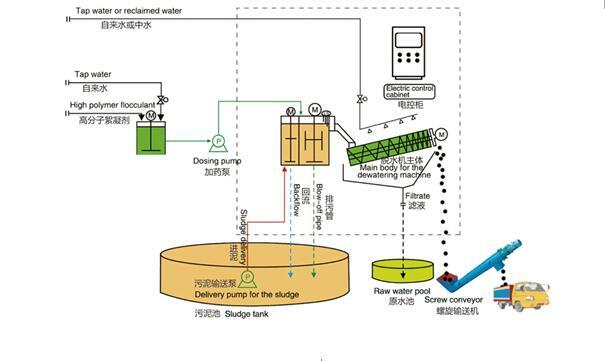 The rotation of the screw shaft promotes the transport of the sludge from the enrichment section to the dewatering section, and also continuously drives the swimming ring to clean the filter joint to prevent clogging. 1. Concentration: When the screw pushes the shaft to rotate, the multiple solid laminates located on the periphery of the push shaft move relative to each other. Under the action of gravity, water is filtered out from the relatively moving lamination gap to achieve rapid concentration. 2. Dehydration: The concentrated sludge moves forward with the rotation of the screw shaft; along the exit direction of the mud cake, the pitch of the screw shaft gradually becomes smaller, and the gap between the ring and the ring gradually becomes smaller, and the volume of the spiral cavity becomes smaller. Continuous shrinkage; under the action of the back-pressure plate at the outlet, the internal pressure is gradually enhanced. Under the continuous driving of the spiral push shaft, the water in the sludge is squeezed out, and the solid content of the filter cake is continuously increased, and finally the sludge is realized. Continuous dehydration. 3. Self-cleaning: The rotation of the screw shaft pushes the swimming ring to rotate continuously. The device relies on the movement between the fixed ring and the swimming ring to realize a continuous self-cleaning process, thereby cleverly avoiding the clogging problem that is common in the traditional dewatering machine. main Composition: main mud bucket, flexible door, motorized faders and control box.